Late Minoan II/IIIA1 complete piriform jar of medium size. During five weeks in May and June 2017, a Swedish team, headed by Professor Peter M. Fischer from the University of Gothenburg, carried out excavations at the Late Cypriot harbour city of Hala Sultan Tekke. The team consisted of 28 students and specialists. Amongst the latter were those trained in osteology, botany, conservation, and Aegean and Near Eastern ceramics. Hypothetical estimations of the size of the city vary between roughly 25 and 50 hectares. A large-scale geophysical survey was planned for June 2017 which is expected to provide more information about the actual size of the city. In 2017, two areas were of specific interest to the general research objectives of this long-term project: City Quarter 1 (CQ1) and Area A.
CQ1 is one of three city quarters which have been discovered by geophysical prospecting and partly exposed by the expedition since 2010. The others are CQ2 and CQ3, which are to the west of CQ1. These three city quarters are in the north-west part of the city and close to the ancient harbor, which is the westernmost part of the modern Larnaca Salt Lake. Initially, the excavations were guided by the results of the georadar survey which indicated stone structures that appeared just below surface. The deepest stone structures which were visible on the georadar map were at a depth of approximately 1m. This penetration depth corresponds to our Strata 1 and 2. These two strata (well-defined layers of occupation separated in time), both of which were violently destroyed, are dated to the 12th century BCE. Stratum 2 dates to possibly around 1200 BCE. However, in the course of the excavations massive architectural units were discovered and exposed below the maximum penetration depth of georadar, i.e. between 1.5 and 2 m from surface. These were not visible on the georadar map. This means that, for the first time, we have evidence of substantial remains of Stratum 3 with a preliminary date in the 13th century BCE, and possible evidence of an even earlier phase of occupation (Stratum 4). One of the rooms of Stratum 3 contains four storage units constructed of vertically placed, flat, worked stones and large pieces of a pithos decorated with plastic wavy lines. These installations were likely used for the storage of food such as grain and olives. 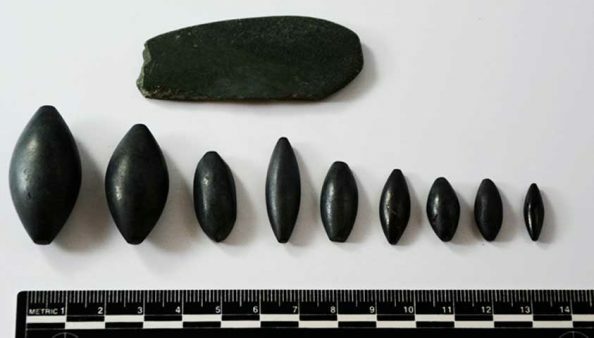 One large (almost 1 m broad) grinding stone placed in the centre of the room along with several smaller grinding stones and two small pounding stones suggest a function related to the processing of cereals or vegetables. This is further supported by the preliminary archaeobotanical results, which demonstrate barley, olives, grapes and other, as yet unspecified cereals. A series of three hard-packed floors were in use within the storage area. At least two other installations were placed on these floors, including a mudbrick-lined fireplace, and a feature with two identical postholes placed close to each other. Two of the floors are separated by a thin layer of ash which probably came from the fireplace. Other finds from this room are sherds of faience bowls, most likely Egyptian, a spindle whorl, and a Base Ring bull (part of a kernos). The pottery includes local plain and coarse wares along with White Painted Wheel-made Ware, White Slip I and II, Base-ring I and II, and imported Mycenaean vessels. 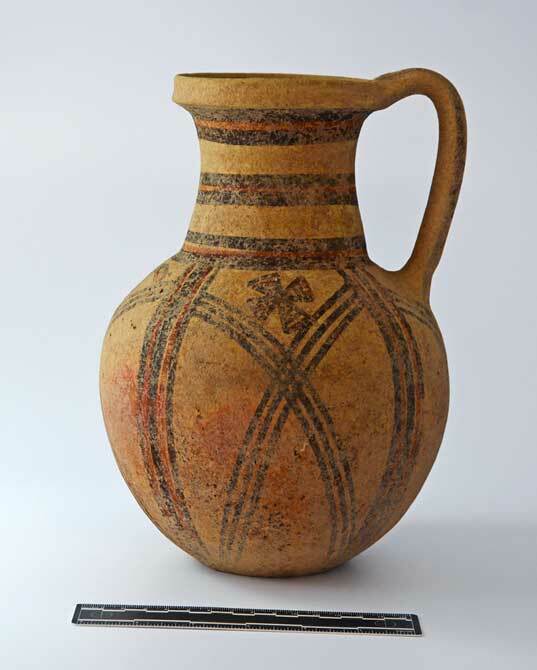 There is a rare example of a decorated pilgrim flask most likely imported from the Levant, and a handle with an inscribed Cypro-Minoan sign. Another room is a workshop, where a furnace, a large amount of slag and ore, and a pit, intentionally filled with unfired clay, was found. Two floors associated with the Stratum 3 walls were plastered by limy clay. The furnace on top of the upper floor was made of a thick layer of mudbricks. The use of this furnace for copper production is attested by the large amount of slag and copper ore together with fragments of ceramic tools and burnt debris and ash. In addition, another two locally produced ceramic handles inscribed with Cypro-Minoan signs were found in these layers which are associated with metal production. Below the two floors, evidence of metal production activities is missing. The fill below the lowest floor (possibly above Stratum 4) contained an almost complete Base Ring I bowl together with sherds of White Slip I. The Mycenaean pottery collected from the layers so far associated with Stratum 3 dates to Late Helladic IIIB, viz. the 13th century. This is supported especially by the presence of Aegean imported deep and shallow bowls, both shapes so far rarely attested in reliable settlement contexts at Hala Sultan Tekke. Further rooms are expected since several walls continue into the sections. Parallel with the project in the settlement, excavations took place in Area A. This area, excavated since 2013, is roughly 550 m east of CQ1 and close to the mosque of Hala Sultan Tekke. Here, the choice of areas of excavation were again guided by geophysical prospecting, but mainly by magnetometer measurements since architectural remains – ideal for georadar – are missing. The magnetometer map shows more than 80 “pits” several of which were exposed during the past five seasons. These pits turned out to be wells, prosperous offering pits, and tombs with rich contents reflecting a cosmopolitan society with far-reaching contacts. In 2016, the oldest of these features, Tomb X, dates to the 16th century BCE. Amongst the rich finds were excellent jewellery and some 70 ceramic vessels including one of the earliest Mycenaean imports to Cyprus: a virtually complete jug which, according to established pottery chronology, should be dated to Late Helladic IIA. Another of these early and rich tombs, Tomb LL, was excavated in 2017. It contained complete/intact vessels of Bichrome Wheel-made Ware, White Slip I and Base-ring I but no Mycenaean pottery. An extraordinary find from Tomb LL is represented by a Late Minoan II/IIIA1 complete piriform jar of medium size. 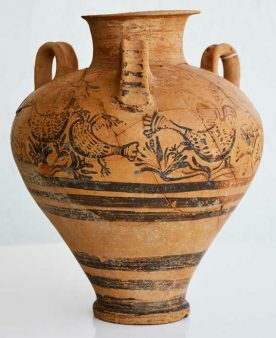 It is decorated with a complicated pattern of birds and other pictorial motifs which have excellent parallels in vessels from the Palace of Knossos. It seems that the skeletons (a minimum number of five) were part of a secondary burial, since the bones were not found in situ while the tomb gifts were complete and even intact. Around the bones of the hand of one of the skeletons were nine haematite weights of varying weights. They were intentionally placed there, most likely in a bag of perishable material, e.g. leather or textile. Other excavated “pits” in Area A were offering features and wells. Future plans include the extension of CQ1, both in depth and area, the investigation of additional “pits” in Area A, and a large-scale geophysical survey of 25 hectares in order to record the actual size of the city.